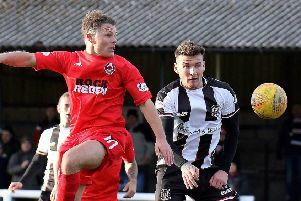 Clyde put a difficult week behind them with a much-needed victory at home to Stirling Albion to keep their promotion bid on track. Goals from Chris McStay, Martin McNiff and John Rankin earned Danny Lennon’s side victory from the first of three home hames in eight days. A win was essential for the Bully Wee and Rankin tested the palms of Calum Ferrie early on. But it would be another long-range strike which proved to be the undoing of the Stirling keeper as McStay’s effort from 20 yards deflected off Jordan McGregor past the despairing Ferrie to give the home side an early advantage. The increasingly snowy conditions threatened to disrupt the play and Blair Currie’s heart will have been in his mouth when he fumbled a loose ball on the edge of his area under the challenge of Peter MacDonald, but Martin McNiff was on hand to save the day with a goal-line clearance. A glorious chance to double the lead fell to Raymond Grant in the area, but Ferrie was again on hand to tip the resulting effort over the bar. And Stirling struck next in the back-and-forth encounter, though, when an inch-perfect ball from Dominic Docherty after a short-corner routine ten minutes into the second half landed on the head of Kyle Banner, whose superb effort back across goal nestled in the corner. After a stagnant start to the second period, Danny Lennon rang the changes, and the introductions of Scott Banks and Kristoffer Syversten at the expense of Jordan Stewart and Ally Love seemed to swing things back towards the Bully Wee. Despite some impressive build-up play, nothing seemed to be going their way in front of goal, until McNiff eventually broke through. 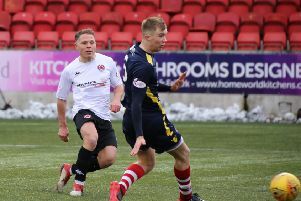 The centre-half got on the end of a Mark Lamont corner with eight minutes remaining to force a looping header over the line and spark relieved celebrations. A bad injury to Stirling’s Danny Jardine shortly after – with all three subs having been made – forced the visitors to chase the remainder of the game with ten men, to no avail, and Rankin made sure of the points deep into stoppage time.